The Global Food Safety Initiative . What We Do Why We Do It Our Unique Position How We Work The Influencers Leading It 2 Our Benchmarking Work Our Capability Building Work Our Recent Achievements Our Goals Going Forward . Safe food for consumers everywhere The Global Food Safety Initiative (GFSI) drives continuous improvement in food safety management practices …... In January 2011, the Global Food Safety Initiative (GFSI) published version 6 of the GFSI Guidance Document, continuing an iterative process that started in 2001 with the first Version. party food safety certification to enhance trade and supplement national regulatory frameworks. The panelists, who include international regulatory leaders, will describe regional and global initiatives between the public and private sectors that apply third-party certification as a vehicle for trade harmonisation. BREAKOUT 6 The Future of Microbiology... global network of expertise from institutions and food safety professionals who could be mobilized to address high priority risks or threats identified at country, regional or international levels and provide an essential resource of trainers. The Global Food Safety Initiative ( GFSI ) is a private organization, established and managed by the international trade association, the Consumer Goods Forum.... Blacklisted Links Found on Global Food Safety Initiative Cyberbot II has detected links on Global Food Safety Initiative which have been added to the blacklist, either globally or locally. Links tend to be blacklisted because they have a history of being spammed or are highly inappropriate for Wikipedia. 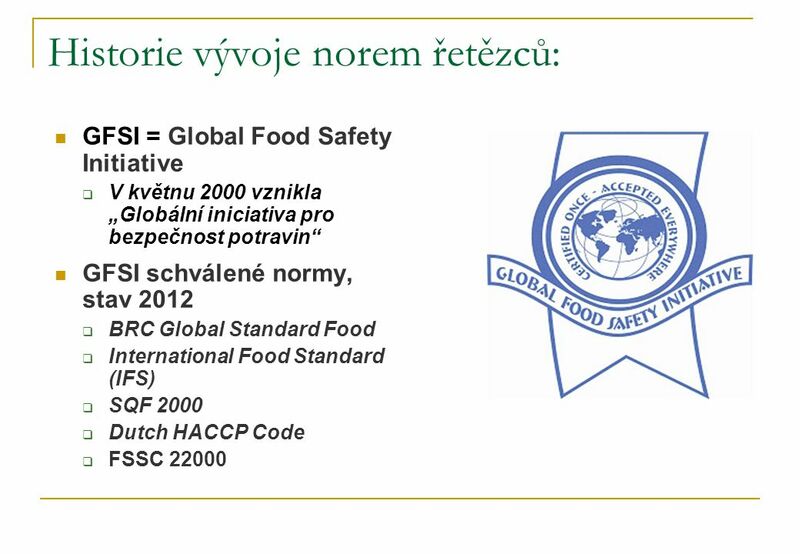 Global Food Safety Initiative. At a glance This document provides an overview of the Global Food Safety Initiative (GFSI). GFSI is one of the several standard systems that are referenced in Standards Map, the interactive web-based tool on private standards developed by the T4SD program of ITC. ssi disonible en ranais For information on the Food Safety Program contact the CVO/Food Safety Knowledge Centre. For technical information, call 204-795-7968 or 204-795-8418 in Winnipeg; or e-mail foodsafety@gov.mb.ca. numerous food safety manager certification courses • In addition, he is a GMP/HACCP instructor, a Lead Auditor trainer, and is also certified to consult on the Global Food Safety Initiative by SQF.